St Pancras ( /sənt ˈpæŋkrəs/) is an area of central London. 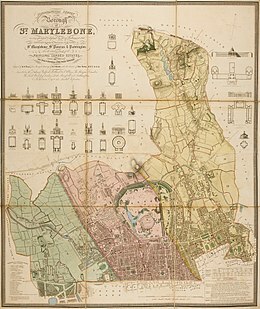 For many centuries the name was used for various officially-designated areas, but it is now used mainly for the railway station and for upmarket venues in the immediate locality, having been largely superseded by other place names including Kings Cross, Somers Town, and Camden Town, or simply Camden. A map showing the wards of St Pancras Metropolitan Borough as they appeared in 1916. The district now encompassed by the term "St Pancras" is not easy to define, and its usage as a place name is fairly limited. The name is sometimes applied to the immediate vicinity of the eponymous railway station, but King's Cross is the usual name for the area around the two mainline stations as a whole. St Pancras was originally a medieval parish, which ran from close to what is now Oxford Street north as far as Highgate, and from what is now Regent's Park in the west to the road now known as York Way in the east, boundaries which take in much of the current London Borough of Camden, including its central part. However, as the choice of name for the borough suggests, St Pancras has lost its status as the central settlement in the area. In the 1790s Earl Camden began to develop some fields to the north and west of the old church as Camden Town. About the same time, a residential district was built to the south and east of the church, usually known as Somers Town. In 1822 the new church of St Pancras was dedicated as the parish church. The site was chosen on what was then called the New Road, now Euston Road, which had been built as London's first bypass, the M25 of its day. The two sites are about a kilometer apart. The new church is Grade I listed for its Greek Revival style; the old church was rebuilt in 1847. In the mid 19th century two major railway stations were built to the south of the Old Church, first Kings Cross and later St Pancras. The new church is closer to Euston Station. The parish of St Pancras was administered by a vestry until the Metropolitan Borough of St Pancras was established in 1900. In 1965 the former area of the borough was combined with that of two others to form the London Borough of Camden. During the 18th and 19th centuries, St Pancras was famous for its cemeteries: as well as the graveyard of Old St Pancras Church, it also contained the cemeteries of St James's Church, Piccadilly (currently under threat from the High Speed Two Rail proposals), St Giles in the Fields, St Andrew, Holborn, St. George's Church, Bloomsbury, and St George the Martyr, Holborn. These were all closed under the Extramural Interment Act in 1854; the parish was required to purchase land some distance away, and chose East Finchley for its new St Pancras Cemetery. The disused graveyard at St Pancras Old Church was left alone for over thirty years, until the building of the Midland Railway required the removal of many of the graves. Thomas Hardy, then a junior architect and later a novelist and poet, was involved in this work. Particularly, he placed a number of gravestones around a tree, now known as "the Hardy Tree". The cemetery was disturbed again in 2002-03 by the construction of the Channel Tunnel Rail Link, but much more care was given to the removal of remains than in the 19th century. The name St Pancras survives in the name of the local parliamentary constituency, Holborn and St. Pancras. One of the political wards in Camden is called St Pancras and Somers Town; however, ward boundaries are chosen to divide a borough into roughly equal slices with little regard to historical boundaries or day-to-day usage. Besides Somers Town and the area around St Pancras Old Church, the ward includes much of Camden Town and the former Kings Cross Goods Yard, which is being redeveloped as a mixed-use district under the name Kings Cross Central. Old St Pancras Church and its graveyard have links to Charles Dickens, Thomas Hardy, and the Wollstonecraft circle. Immediately to the north of the churchyard is St Pancras Hospital, originally the parish workhouse and latterly the London Hospital for Tropical Diseases. St Pancras is one of the best-known railway stations in England. It has been extended and is now the terminus for the Eurostar services through the Channel Tunnel. The nearest London Underground stations are King's Cross St Pancras tube station and Russell Square. The nearest National Rail stations are London King's Cross and St Pancras railway station. ^ Hinson, Colin (2003). "St. Pancras". http://www.genuki.org.uk/big/eng/MDX/StPancras/StPancrasHistory. ^ "History". HS1 Ltd. http://stpancras.com/history. ^ a b "The Hardy Tree, St Pancras Churchyard, London". 2006-04-17. http://www.victorianweb.org/photos/hardy/74.html. This page uses content from the English language Wikipedia. The original content was at St Pancras, London. The list of authors can be seen in the page history. As with this Familypedia wiki, the content of Wikipedia is available under the Creative Commons License.